With its distinctive raised deck and long cockpit, the innovative Bill Lapworth design evolved from the highly successful pocket ocean racer and well known San Francisco Bay boat, the Cal 20. Built by Jensen Marine, which at one time in the '60s was the largest production builder in the country, and later by Bangor Punta Marine and others, the Cal 25 had a long production run through all its incarnations. From 1965 through 1983, a couple thousand Cal 25s were launched. Dont confuse this original Cal 25 with a later Cal 25 that was beamier and did not have a raised deck. It was in production for only a short time. 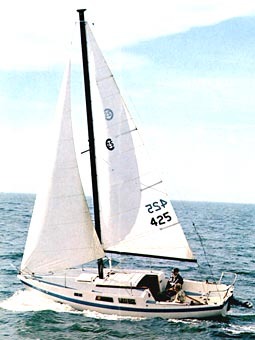 The Cal 25 was originally marketed as an ocean racer that could occasionally double as a cruiser during the golden age of fiberglass boats when a 25-footer was considered big. The prospect of serious cruising in a Cal 25 these days seems almost comical, however, it can be done. In fact, Dave and Jaja Martin and their two young children completely rebuilt a stock 25 and then proceeded to log 45,000 miles while circumnavigating. That, however, is taking things to extremes. The Cal 25 is actually a fine first for a family boat that delivers pretty good performance while graciously tolerating learning miscues. And most importantly, you can find an assortment of decent 25s on the market for around $5,000 (or less), while nice, late model boats can be had for less than $10,000. A Cal 25 is a logical boat to test the waters of family sailing before committing to a bigger or newer boat and a big monthly payment. Aficionados of '60s designs quickly recognize the Cal 25 as a classic collaboration of Bill Lapworth and Jack Jensen. From the spoon bow to the flattish transom, from the wide cove strip to the raised deck with long rectangular portlights, the Cal 25 cuts a handsome profile. Lapworth usually saved his best work for what was below the waterline and the 25 is no exception. 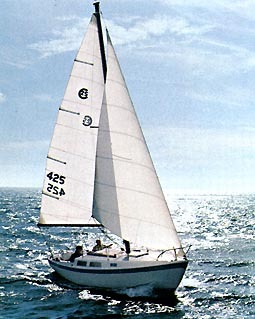 Like a miniature Cal 40, the 25 features a long fin keel and spade rudder, which was a radical concept in 1965, and a relatively long waterline of 20 feet. The displacement of 4,000 pounds was considered quite light, although the cast lead ballast of 1,700 pounds certainly helps keep the 25 on its feet. In fact, the Cal 25 is a remarkably stiff boat, as numerous ocean passages attest, and is by no means over-canvassed with 286 square feet of sail area. By comparison, the Cal 25, yesterdays nimble racer, is heavier and has less sail area than a typical modern pocket cruiser like the Catalina 250. The Cal 25 hull is solid fiberglass and typical of the construction methods of the day: it is rather thick, resin rich, and often not all that fair with occasional hard spots and print throughs, which means that the underlying glass fabric is visible in the surface of the hull. The one-piece molded deck was reinforced with plywood. The hull and deck joint, which is set on a small flange, is riveted and covered with a 6-inch fiberglass tape from the inside. It is covered with a rubber rubrail and therefore subject to damage from impact. The lead keel is externally fastened and the spade rudder is draped over a robust stainless steel stock. The forward bulkheads, which are usually mahogany-faced plywood, and tabbed to the hull, front a deck beam, which was actually molded into the deck and supports the deck-stepped spar. The inboard chainplates are bolted through the bulkheads as well. As with any older boat, especially one that has been raced hard and put away wet, there are many problems to be aware of before purchasing. With Cal 25s, however, it is difficult to comment on general problems because the boats have usually been retrofit by previous owners along the way and one can't always be sure what has and hasn't been upgraded. Still, there are some common flaws to be on the lookout for. A lot of old Cal 25s have soft decks, some are spongy. Invariably the plywood has rotted, usually the result of a deck leak, and needs to be replaced. At least the plywood is accessible in most places. Although it is a big job, it is possible to stiffen wet deck sections with new marine-grade plywood, although the purchase price should certainly reflect this time-consuming repair project. If the deck is soft, its likely that the main deck beam may be sagging or worse, delaminating. Again, this is not a task for the mechanically challenged, yet it is certainly a do-it-yourself-type task if you have adequate woodworking and fiberglass skills. John Hall, who owns a 1970 Cal 25, Lady Marion, suggests adding a new mast compression post at the same time. The forward bulkheads may also need attention. If the bulk heads are pulling away from the hull, they can usually be wrangled back into place, especially when the rig is out of the boat, and refiberglassed.If they have begun to rot, usually caused by leaking chainplates, it may be necessary to replace them. Unless you are literally stealing the boat, you should probably look for another 25. Another common problem is leaking portlights. Originally, they were safety glass and if you need to replace them, use Plexiglas® or LEXAN®. Also, the rubrail is often in sad repair and needs to be replaced. Fortunately, Steve Seal of Seals Spars and Rigging in Alameda, California, has new rub rails available. When hauled, check the rudder for any signs of cracking. The original rudder was light sandwich construction, subject to cracking, especially after a cold winter on the hard. Seal, who was a rigger with Jensen Marine in the '60s, is an excellent resource for Cal owners and can help you track down a new rudder if necessary. Also, Cal 25s have a tendency to blister, although they are certainly not unique in this category. One item to inspect carefully is the electrical system. The original boats came with an "optional" electrical system, that was basic to say the least. Most boats come with some type of owner-installed electrical system and these can vary wildly. Carefully check the panel and wiring, being alert to twisted wire and taped-over connections. These are not only a nuisance and cause electrical instruments to fail, they can be dangerous. One final item to check carefully is the main companionway hatch on older boats. The original design was a three-piece model that not only slid on tracks, but popped up. Many of these hatches were retrofitted at some point so be sure to check the construction carefully. The cockpit is the most distinctive feature on the Cal 25. It is 7 feet 6 inches long, which represents 30 percent of the LOA, and is quite comfortable. It can easily accommodate four adults. John Hall remembers a time when he had 12 people on board on the Columbia River. 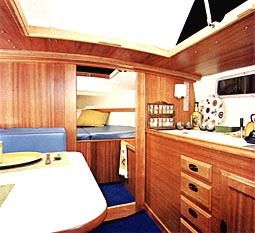 In a way it is surprising that the 25 has such a proud record of offshore sailing because the voluminous cockpit and huge companionway are certainly not designed for bluewater sailing. The 25 is a tiller boat and, although I'm sure some have probably been retrofitted with wheel steering, I have never seen or heard of one. Although pulpits and lifelines were options, most boats on the market have them. Be sure to carefully check that they are through-bolted with backing plates, as owners often undertook this upgrade themselves.